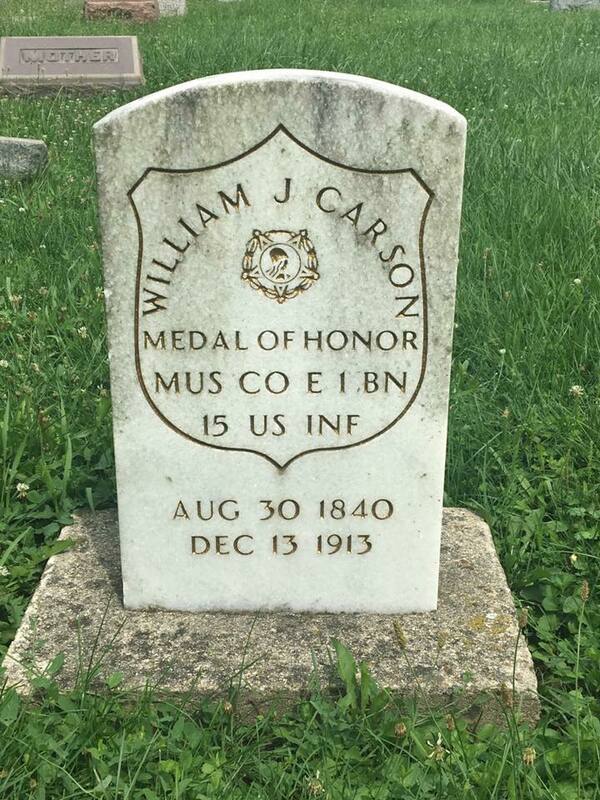 William J. Carson was one of about twenty Civil War Musicians to receive the Medal of Honor. He is the only musician ever to receive the medal for musical duties. Born in Westmorland County, Pa., in 1840, he had grown up in Ohio. 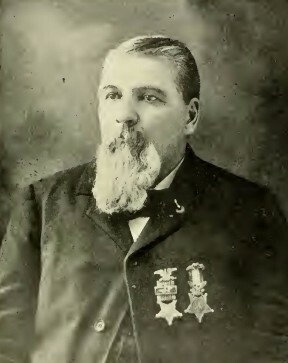 On September 2, 1861, he enlisted at Greenfield, Ohio in the 15th U. S. Regular Infantry, and was assigned to Company E, with the rank of musician. He served honorably at the battles of Shiloh, Stones River, and in the Tullahoma Campaign. But, it was in September, 1863, at the Battle of Chicamauga, that his great moment came. 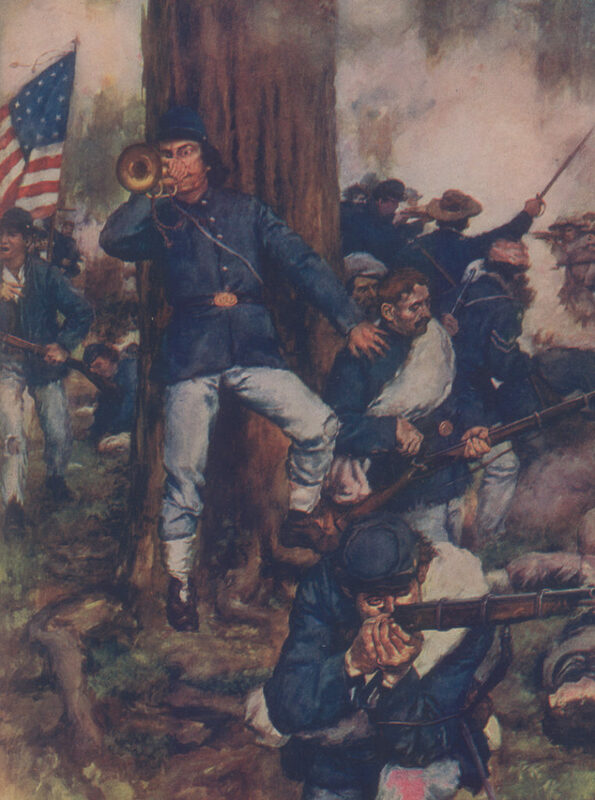 Carson, a bugler, helped rally a detachment of the Regular Army Brigade (Regular Brigade) of the Union Army of the Cumberland to hold an advanced position for a critical period of time at the Battle of Stones River on December 31, 1862. The forward regiments held off a large Confederate attack long enough to permit the Union forces which were withdrawing elsewhere on the battlefield to regroup and hold critical defensive lines protecting their supply line and route of retreat over the Nashville turnpike and a railroad line. The forward regiments ultimately had to withdraw in haste in the face of superior force but then held key fallback defensive positions and held the field at the end of the battle. While in the retreat across an open field and under fire, Carson helped a wounded comrade from the battlefield, saving him from probable death on the field or capture. On both days of the Battle of Chickamauga, on his own initiative, Carson played a key role in rallying Union troops under heavy attack near the end of the Union line by sounding bugle calls to rally the regiment. These actions delayed further Confederate attacks long enough on the first day for the broken Union regiments to regroup and hold their ground. On the second day of the battle, the extra time gained by the troops rallied by Carson’s actions allowed most of the Union Army to retreat to the defenses of Chattanooga, Tennessee without pursuit by the Confederate soldiers. Carson’s actions rallied the troops and gave the impression that a large number of Union reinforcements were arriving. Renewed Confederate assaults were delayed so the Confederates could mass their forces against the supposed reinforced Union line. This delay allowed most of the Union Army on the field, including most of the XIV Corps to which the regulars were assigned, to retreat to a more secure position at Chattanooga. The small remaining rear guard force, including Carson, held the Union line for three additional critical hours until most of the remaining defenders ran out of ammunition and were taken prisoner. At the request of Major-General Rosecrans, I have the honor to make the following report of Private William J. Carson, bugler in the First Battalion, Fifteenth U. S. Infantry;” On Saturday, September 19, when the regular brigade was falling back, he behaved with most conspicuous gallantry; with a sword in one hand and his bugle in the other, he sounded constantly the ‘Halt,’ the ‘Rally,’ and the ‘Forward;’ espying a stand of colors belonging to the Eighteenth U. S. Infantry, he rushed up to them and sounded ‘To the color.’ His conduct attracted the notice and elicited the admiration of the whole brigade. On Sunday, September 20, before our battalion was engaged, the Eighteenth, being pressed by vastly superior numbers, was falling back; Carson by some means became the possessor of a musket and constituted himself a provost guard. One of the officers attempted to pass him, but he positively refused to allow it, stating that it was against his orders. All this time he continued to sound the various calls on his bugle. I regret to state that his fate remains a mystery; he was last seen by me late on Sunday afternoon behind the breastworks. I can only hope that he is a prisoner.”…. [Surv.Assoc. ]: Association of Survivors Regular Brigade Fourteenth Corps Army of the Cumberland Proceedings of Reunions, 1894-1897 Columbus, Ohio, 1898. This entry was posted on Friday, October 19th, 2018 at 10:42 am	and is filed under Bugle Stories, Buglers Through History, General Interest, History of Taps, History of the Bugle. You can follow any responses to this entry through the RSS 2.0 feed. You can leave a response, or trackback from your own site. Makes me very proud to have been a musician in the 158th Army band, 113th Army Band ay Fort Knox, Kentucky 1968-71 and the 319th Statue of Liberty Band, Fort Totten , New York. 1971-2005.